…We are now in a state of war which will yield to nothing. The whole South is in a state of revolution, into which Virginia, after a long struggle, has been drawn; and though I recognize no necessity for this state of things, and would have foreborne and pleaded to the end for redress of grievances, real or supposed, yet in my own person, I had to meet the question whether I should take part against my native state. With all my devotion to the Union and the feeling of loyalty and duty of an American citizen, I have not been able to make up my mind to raise my hand against my relatives, my children, my home. I have, therefore, resigned my commission in the army, and save in the defense of my native state, with the sincere hope that my poor services may never be needed, I hope I may never be called on to draw my sword. I know you will blame me; but you must think as kindly of me as you can and believe that I have endeavored to do what I thought right. To show you the feeling and struggle it has cost me, I send you a copy of the letter of resignation. I have not time for more. May God guard and protect you and yours and shower upon you everlasting blessings, is the prayer of your devoted brother. Virginia did not secede in the “first wave” of secession. In fact, she didn’t leave the Union until after the war actually started, but it wasn’t because the newly formed Confederacy didn’t want the state. 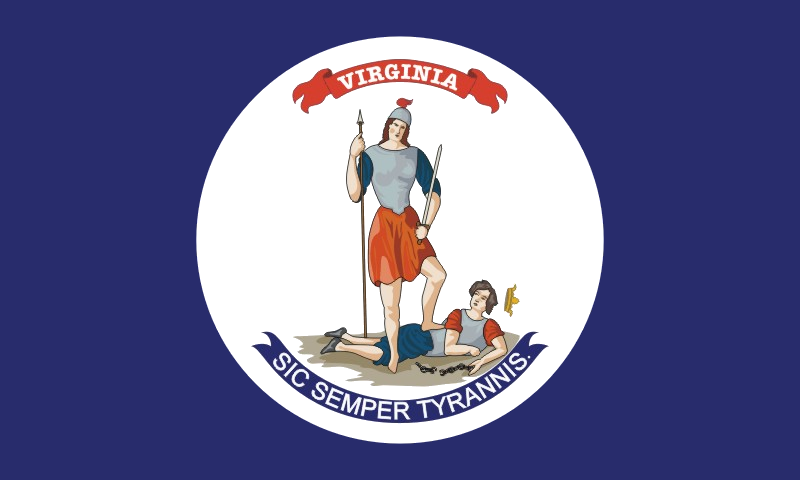 In early American history, Virginia was a leading state in politics and national influence. The home-state of four early presidents, including George Washington, Virginia had both real and symbolic significance in the nation. Although the Confederacy was formed early in 1861, “popular culture” of the secession South experienced a significant shift when Virginia finally joined The Cause; it’s as if Virginia’s secession and joining ultimately legitimized the southern nation. Virginia officially seceded on April 17, 1861. One week later, the state joined the Confederate States of America, and shortly thereafter the new “national” capital was moved to Richmond, Virginia. Immediately after seceding, Virginia began calling out their militia units, cadets from the military schools, and volunteers. As one of the secession states closest to the Union states and the Federal capital, Virginia would experience all four years of war. 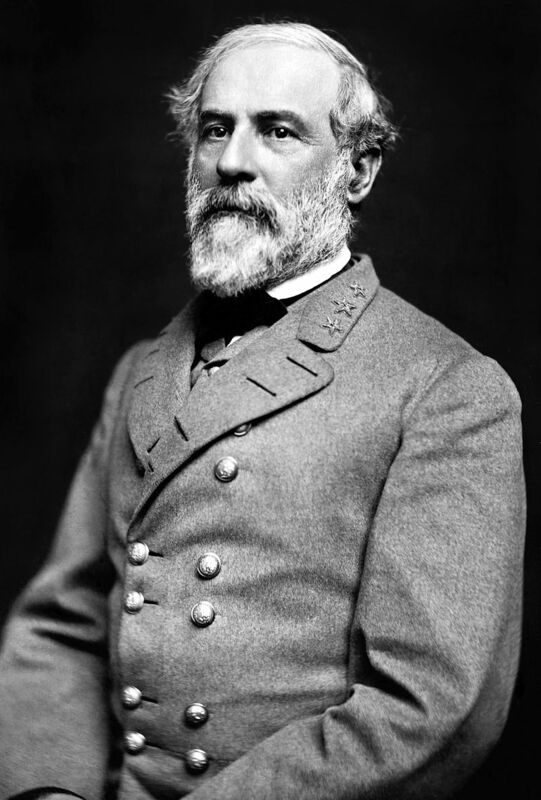 In April 1861, Colonel Robert E. Lee was offered command of all U.S. military forces to put down the Southern rebellion. It was the opportunity of a lifetime – one that most professional soldiers would’ve accepted without hesitation. 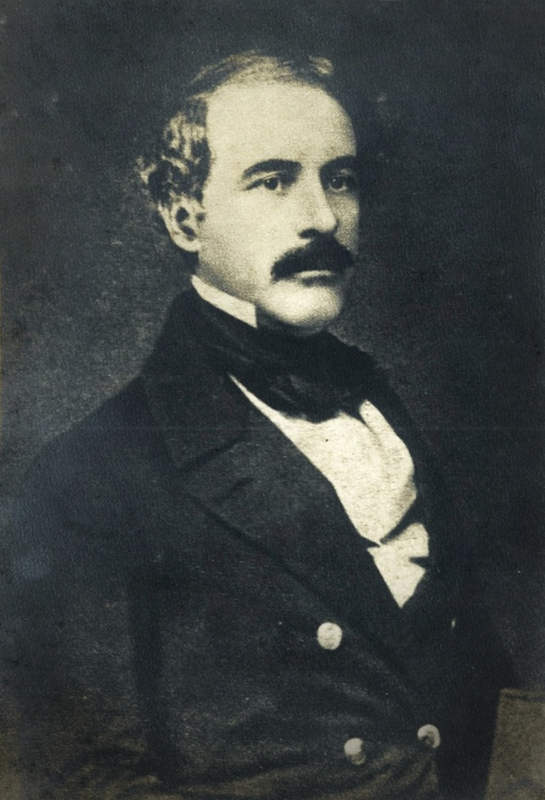 Fifty-four year old Robert E. Lee had been a soldier all his life, serving in the corps of engineers, Mexican-American War, western outposts, and as superintendent of West Point Military Academy. After receiving the offer for army command, Lee spent a wakeful night at Arlington House, pacing the floor and trying to make his decision. He wrote and signed his resignation from the U.S. Army the next morning, then penned the note to his sister, whose family were Union supporters. Lee hoped he would not be asked to take part in the coming conflict. However, he was asked to take command of his home-state’s military forces, and his sense of duty and honor would not let him refuse. 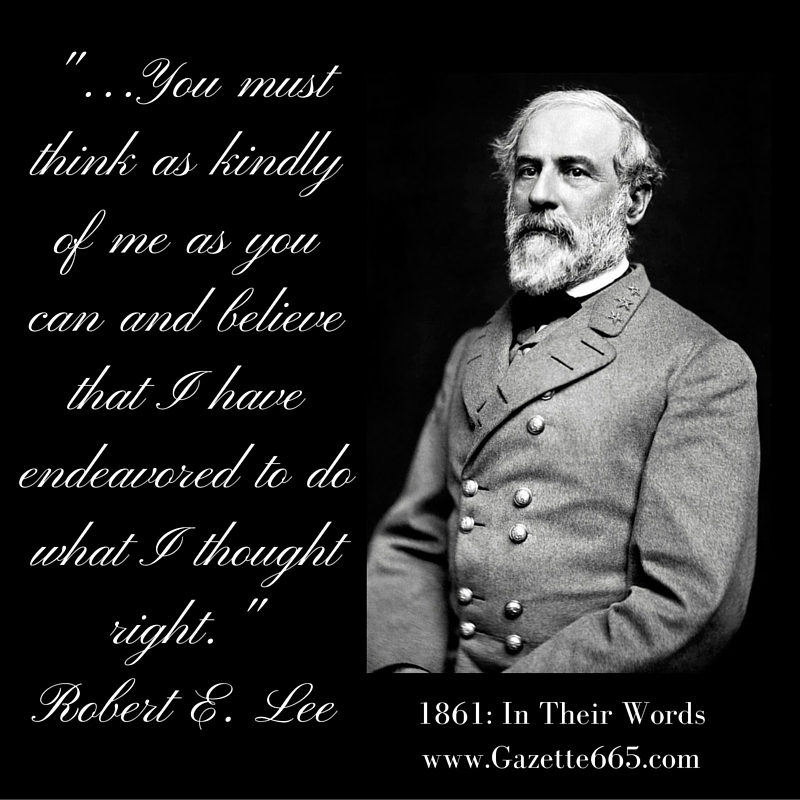 On April 23, 1861, Robert E. Lee accepted command of all Virginia troops; he would later receive a leadership commission from the Confederate government…and, the rest is history. The opening line of the quote is strangely prophetic: a war that will amount to nothing. With hindsight, it is easy to see both the truth and fallacy of the comment. The war accomplished nothing except destruction and the birth of an ideology in the South; however, the war did have important national and global impacts – abolition, reunion, nationalism, and shifting political views, just to name a few. “Think of me as kindly as you can” Lee requests his sister…and perhaps every generation. Not a fire-eating secessionist nor a supporter of slavery, Lee’s reputation has stood the test of time, history, and popular culture fairly well. Perhaps this is because Lee was a soldier, and he maintained that he was only doing his military duty – unwilling to fight against his kin and beloved Virginia, he chose to only draw his sword in defense of his home. That decision, though, would cost more than he ever realized that morning in 1861. P.S. Why do you think Lee’s reputation has survived the “post-Civil War” historiography wars and cultural debates? Wonderful article Sarah. I knew Arlington had been his home, but did not realize that the Union had seized it during the war. How sad. What a noble man. Yes, Arlington was the Robert Lee Family home, but technically it was Mrs. Lee’s property through the Custis Family. She was forced to flee from her home a few weeks later and eventually found a residence in Richmond for the duration of the war. Some of the first burials in the Federal cemetery at Arlington were in Mrs. Lee’s rose garden, a deliberate gesture against the Virginian family. Ironically, Arlington House still stands and the Lees are forever connected to one of America’s most revered national cemeteries. SARAH SAW THIS OLD POST . DID ANY ONE ELSE EVER LIVE THERE AFTER THE WAR ?